Our very own Liesl Lamare, founder of Lamare London, was expecting a baby girl and wanted to celebrate the imminent arrival of her little lady over brunch at The Ivy Chelsea Garden. 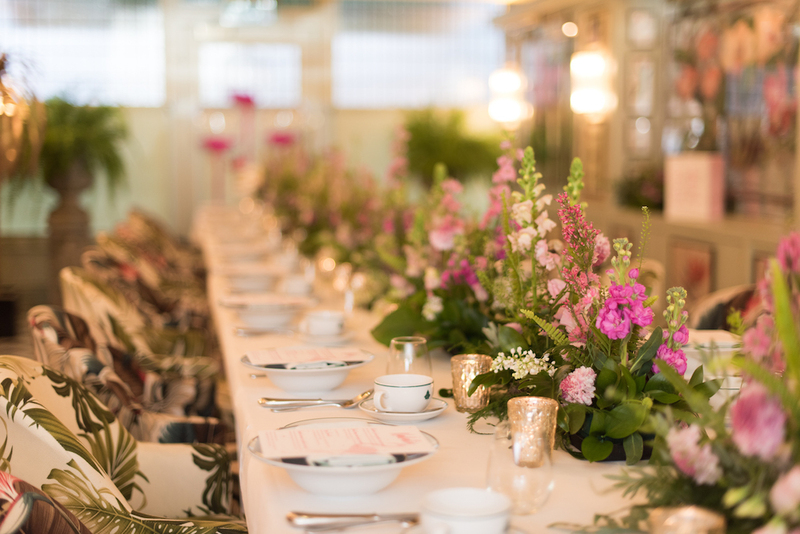 The venue's new private dining room which boasts botanical and tropical prints, gold palm tree lamps and a decadent gold leaf ceiling inspired the theme for the baby shower. 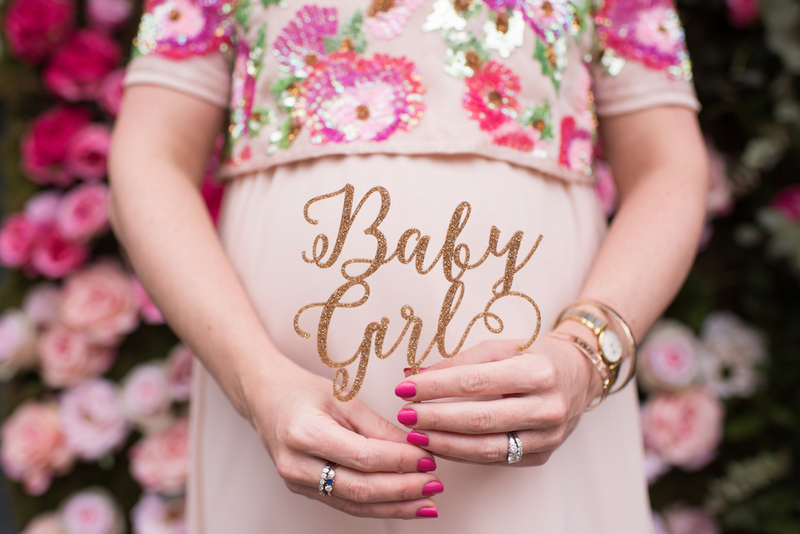 Liesl also wanted to incorporate a fun flamingo within the design to complement the botanical elements as well as lots of pink because she was having a girl. To buck tradition Liesl wanted to include her husband in the celebrations as he was the dad-to-be, and together they invited their close male and female friends and family. 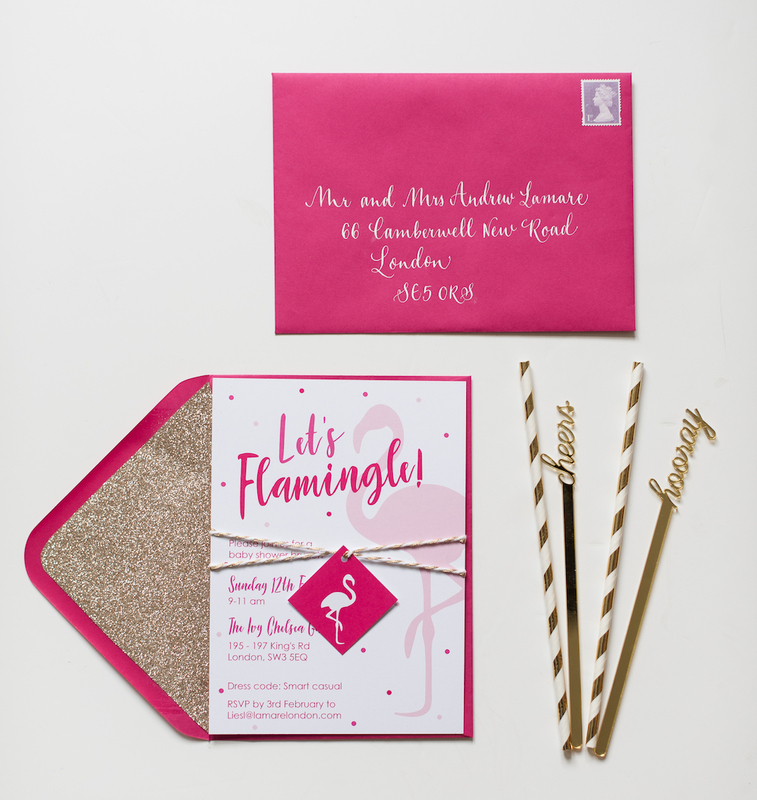 Guests received a hot pink envelope lined with sparkly gold glitter, containing a pink, contemporary design invitation to "flamingle" with them for their baby shower brunch. As guests arrived at The Ivy Chelsea Garden, they walked through an impressive ombré pink wall of roses before entering the private dining room for brunch. The room was set with a long banqueting table with comfortable tub chairs upholstered in botanical and tropical prints. 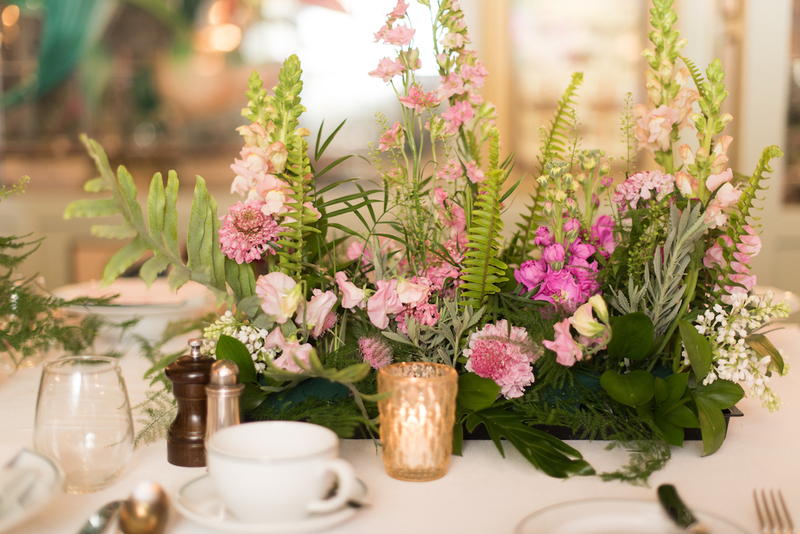 The table was decorated with a meadow of pink flowers and botanical foliage down the centre and elegant gold tea lights. Upon arrival, guests were treated to green juice embellished with gold drink twirlers as well as gold and white stripey straws. The brunch menu started with an assortment of mini pastries as well as baked honey and maple granola with yoghurt. Guests then enjoyed Egg's Benedict or crushed avocado on dark caraway toast as a main course alongside English breakfast tea and coffee. To finish, mum- and dad-to-be had a beautiful vanilla bean sponge cake with vanilla bean buttercream, white chocolate and raspberry ganache and raspberry preserve. 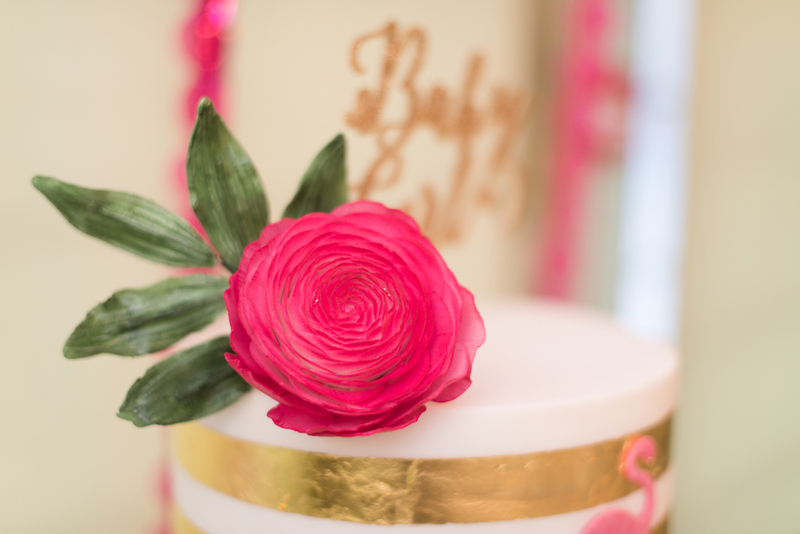 The ivory cake was decorated with elegant gold stripes and a 2D pink flamingo, topped with a hot pink sugarpaste ranunculus flower and a gold glitter acrylic “Baby Girl” cake topper. Their cake sat atop a rose gold sequin tablecloth surrounded by large clear balloons containing fun hot pink feathers with pink tassel tails. 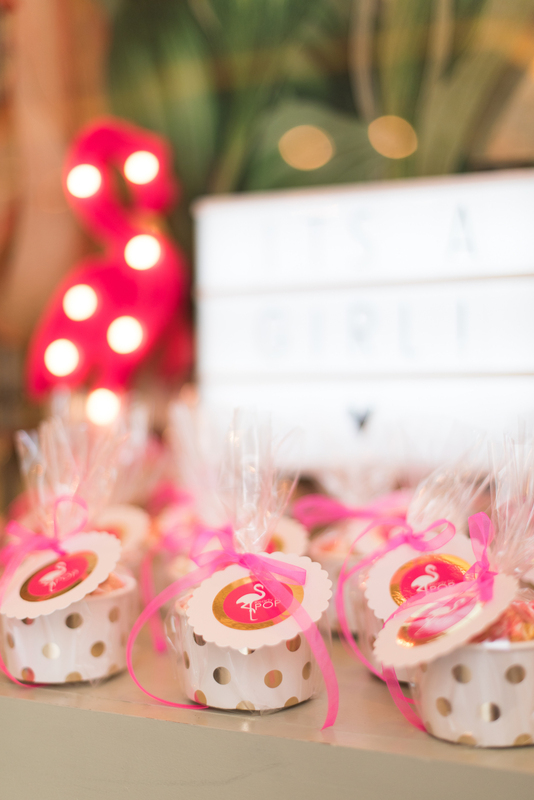 As brunch concluded, guests were gifted gold spotted tubs containing pink, strawberry flavoured popcorn favours with a flamingo "ready to pop" label.